Here in our nest, we love green. This is pretty clear when you walk into our space and are suddenly surrounded by dozens of happy plants peaking out from every corner. 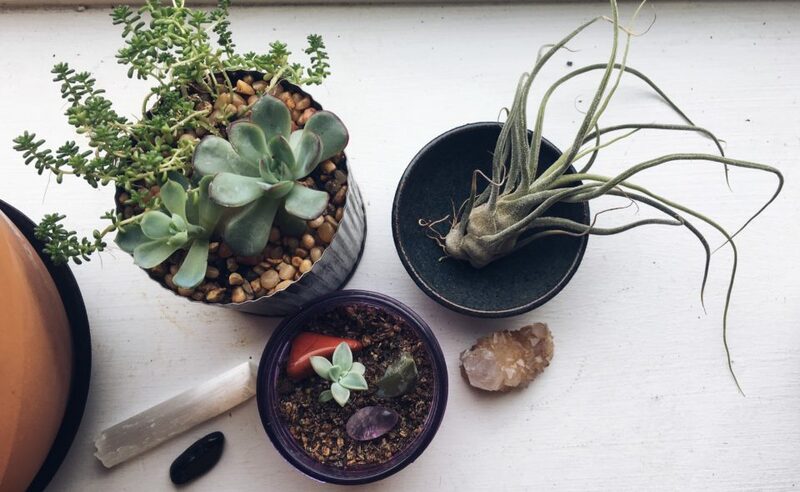 This is something that made me feel super at home here as I am a crazy plant lady to the max and my own space is full to the brim with leafy little friends. Last time I counted I had around 50 or so in my tiny apartment, and that’s after some downsizing. 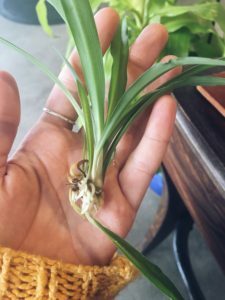 So since I frequently hear about the age old issue of the black thumb from clients I thought I’d share some of my favorite and easy to care for plants as well as some tips and tricks for general care and propagation. Up first is the pothos, in my experience this is one of the hardest plants to kill. 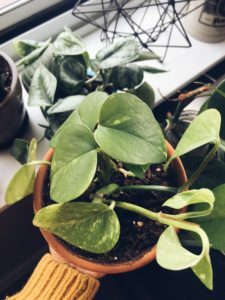 This hearty little plant grows heart shaped leaves and vines that will take over your house if you let it. They prefer twice weekly waterings and bright light. South facing windows are great but they are very adaptable and will also thrive in bright indirect light like a room with an east or west facing window. This cutting should be snipped right above my finger tip. 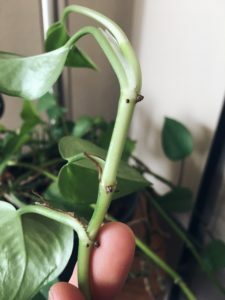 Pothos are crazy easy to propagate with small cuttings that have a leaf or 2 at the top. Stick your cuttings in water and place in bright indirect light. Freshen the water every few days and in 1-3 weeks some teeny roots will start poking out. New roots growing on a cutting. 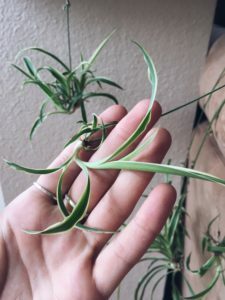 Another easy go-to is the spider plant. Like the pothos it will tolerate low light and less frequent watering (although it’s good to try to get it at least once a week and bright light is always ideal). Brown tips can be an indication that your spider is thirsty (can also happen as a reaction to the chemicals in tap water). This sweet thing is super easy to propagate as well. 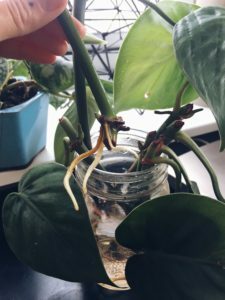 Just snip off the little babies, plop them in water for a few days until some roots poke out, and then plant them. A spider baby that is growing roots and ready to be planted. One of my absolute favorite plants is the wondrous sansevieria! 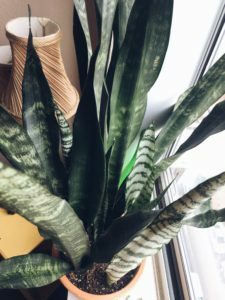 Commonly known as snake plants, or the less flattering mother’s tongue, these guys are known for their skills as air filters and they are great for beginners because they prefer to be left alone most of the time. I have a few of these throughout my plant collection and even though most of my plants are on a biweekly watering schedule the sansevieria’s are only watered once weekly. Over watering is detrimental to most plants but this guy will take it personally so sparse watering is ideal. 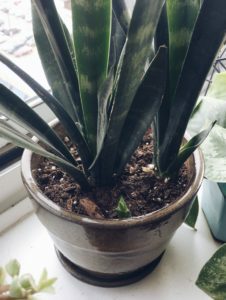 Here you can see one of my sansevieria growing a new little baby! Sansevieria growing a new baby. 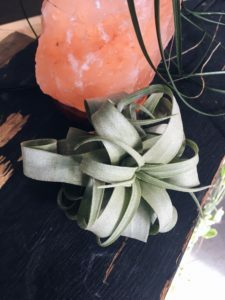 Up next, air plants! I have large handful of these neat plants and I’ve heard various reports on the difficulty of caring for them. Personally I find that the best thing to keep in mind is that these plants are often indigenous to humid ecosystems where they grow on the sides of trees so they can enjoy and absorb the moisture in the air and dappled bits of sunlight. 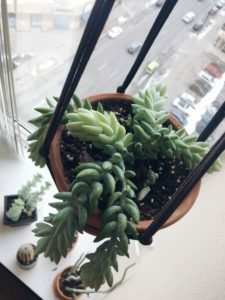 To care for mine I keep them in a window (north or east facing) where they will get a little bit of direct sunlight during the day but mostly bright indirect light. For watering I give them a nice misting every other day or so and a half hour long soak on the weekends. 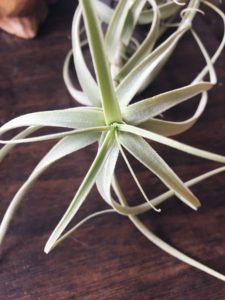 After soaking them it’s important to shake them out a bit or let them dry upside down on a paper towel for a while (especially if they are getting a little less light) so that water doesn’t collect in between the leaves and eventually rot the plant. Most plants will do better with under watering rather than over watering. 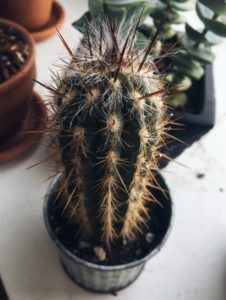 I’m not saying that goes for all plants or that you can forget about them completely, but nature does go through droughts so plants have learned to conserve their energy. However, if the roots are constantly saturated in water they can rot which cuts off nutrients to the plant. Those juicy succulents need light! This means south facing windows for sure. An easy way to tell that your succulent is searching for the sun is if it starts looking ‘leggy’. The hanging plant in the picture below is doing alright but you can see the blurry guy down in the corner is reaching for that sunlight. When potting or repotting plants, place a layer of rocks at the bottom of the pot first, then the soil and plant. The layer of rocks will help with drainage. A good indication that a plant is ready for a new home is if the roots are starting to peak out of the pot’s drain holes. In the wild there are worms and bugs that tunnel around in the dirt which provides room for the roots to breath a little bit. Hopefully there aren’t any worms and bugs in your home so it can be really helpful to aerate the soil with a chopstick every season or when you notice that water is pooling on the surface of the soil rather than being absorbed. Simply stick the chopstick in the soil a few times around the plant, it might damage the roots a bit but they will grow back quickly. 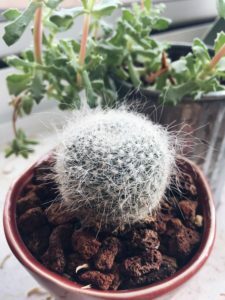 I’ve given some watering guidelines above, but the biggest thing to keep in mind when watering your plants is how much sun they get. 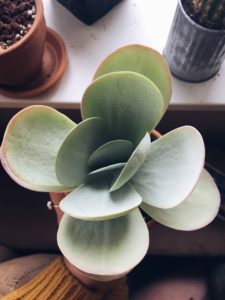 General rule of thumb: if the plant is getting a lot of light in a south facing window, it will need more frequent waterings than a plant thats hanging out in a north facing window. 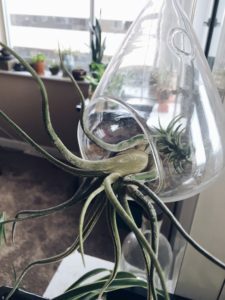 The last thing I’d like to share with you guys is a tip I learned from one of my former hair mentors who was even crazier about plants than me. For your weekly watering, simply replace the water with club soda. Do this once at the beginning of spring and then once again at the end of spring. During the following weeks your plants will grow like mad! Well thanks for reading my planty ramblings, I hope your thumb is a little bit greener! 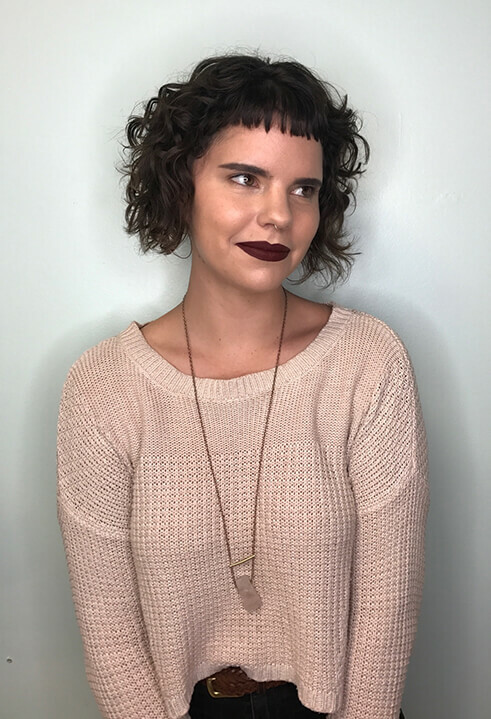 Madalyn hails from the Rocky Mountains and has an energetic passion for hair, art and aesthetics. She graduated from the Aveda Institute Denver and has been practicing hair artistry for more than 3 years.